UPDATE: As of a few minutes ago, Honey and her drake are absent. 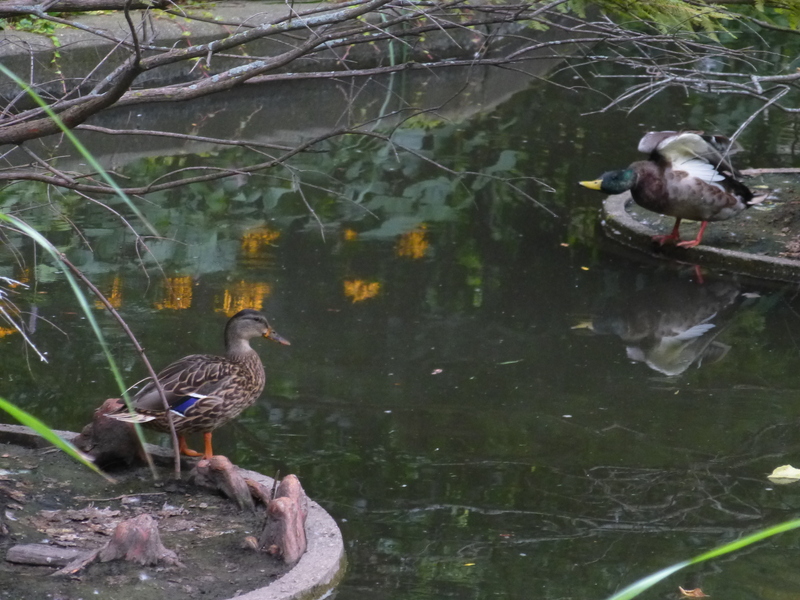 Now they may be gone for good, or may just be exploring or fleeing the sound of construction nearby (they’re working on the sidewalk close to the pond). But this may be it until 2019. I’ll report back at lunchtime. Well, Phoebe has left for good, but Honey is still around, ravenous and being fed like a queen by Anna and me. 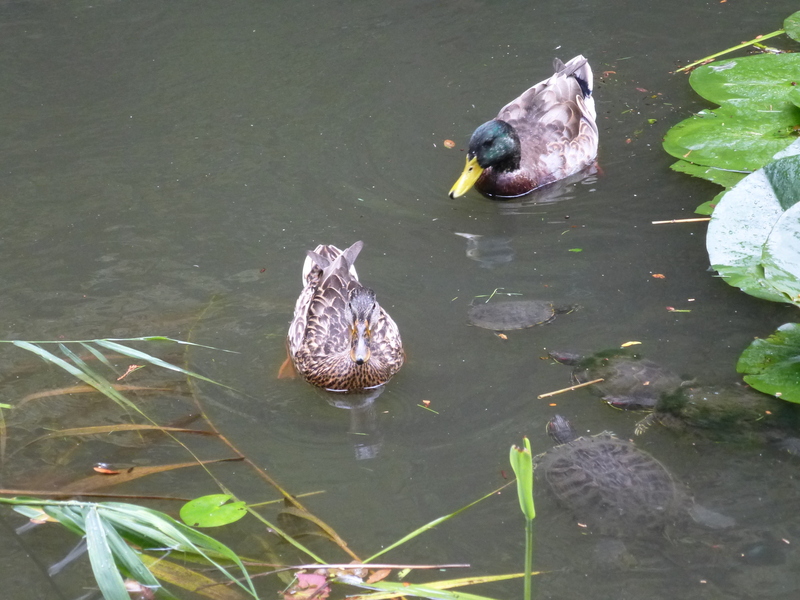 The big news (see below) is that a new duck has joined her: a honking big male! Perhaps they’ll bond and mate next year. But first some videos. 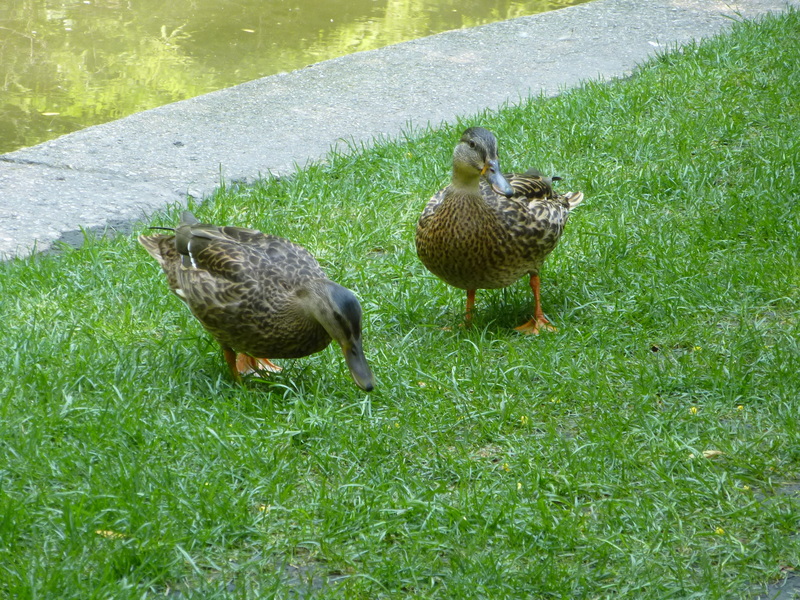 Here are Phoebe and Honey bathing and frolicking about ten days ago. First we see Phoebe, and then Honey ducking and bathing. Honey flaps her wings (not fully feathered) at about 43 seconds in and jumps on Duck Island #1, while Phoebe ducks herself and spreads her wings at about 1:16 before joining her mom on the island. Phoebe (rear) and Honey palling around before the Big Chainsaw Trauma. This photo was taken August 12. 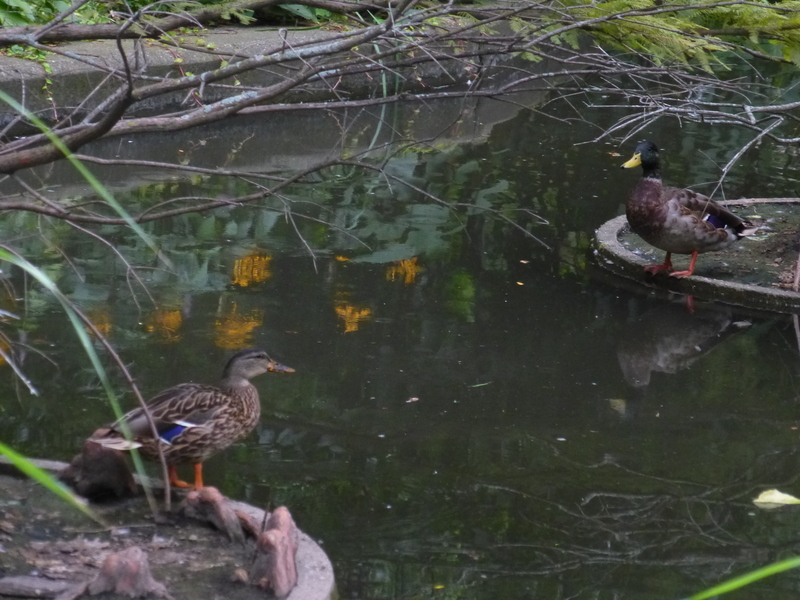 Two days ago I returned from Connecticut to find Honey alone in the pond. 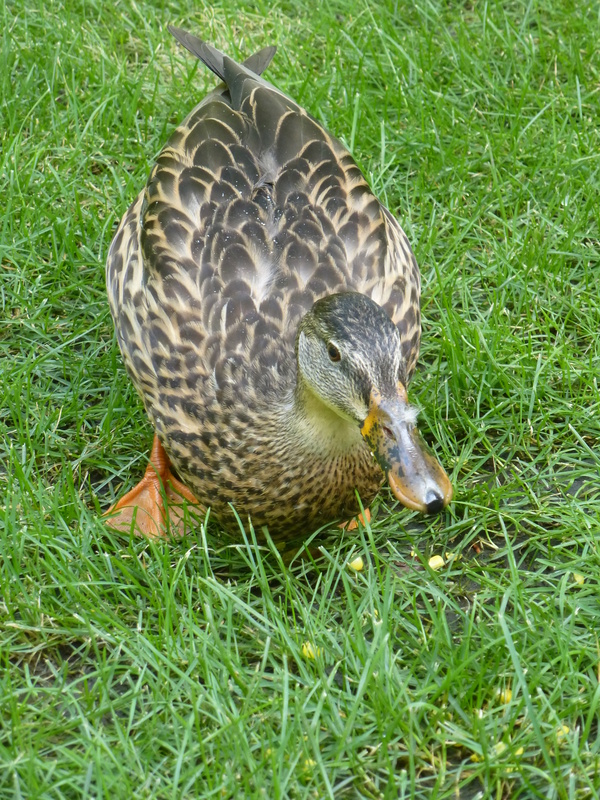 When I called her from the water, she waddled out on land to come to me for corn. 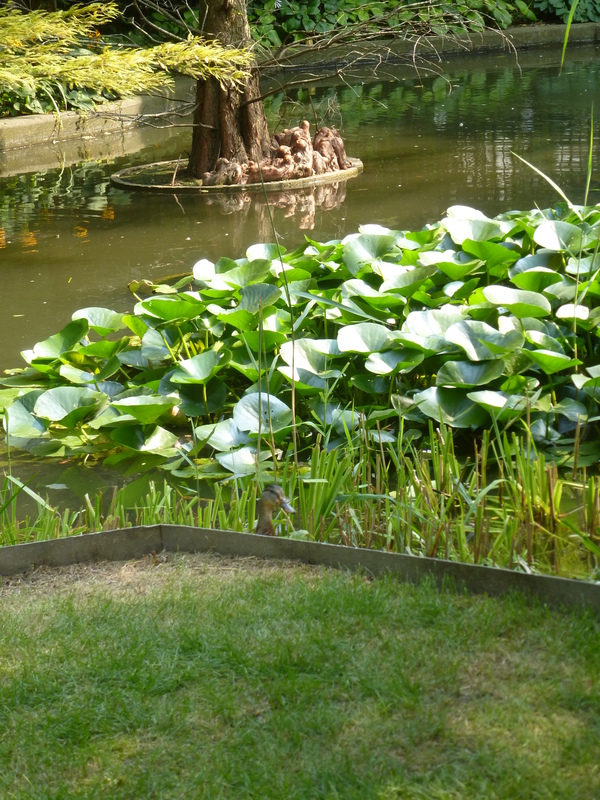 Can you spot the duck? I can’t get enough photos of My Best Feathered Girl. 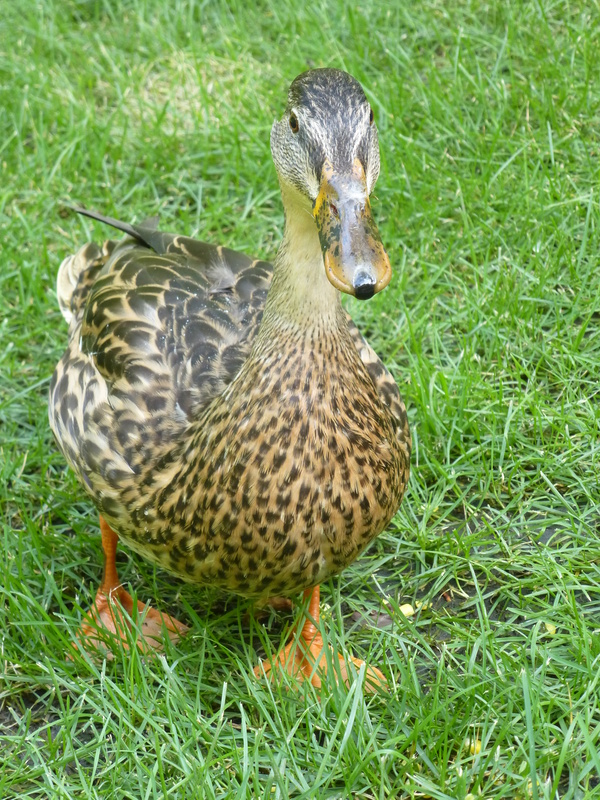 Isn’t she cute—and in good shape for having just fledged eight ducklings? 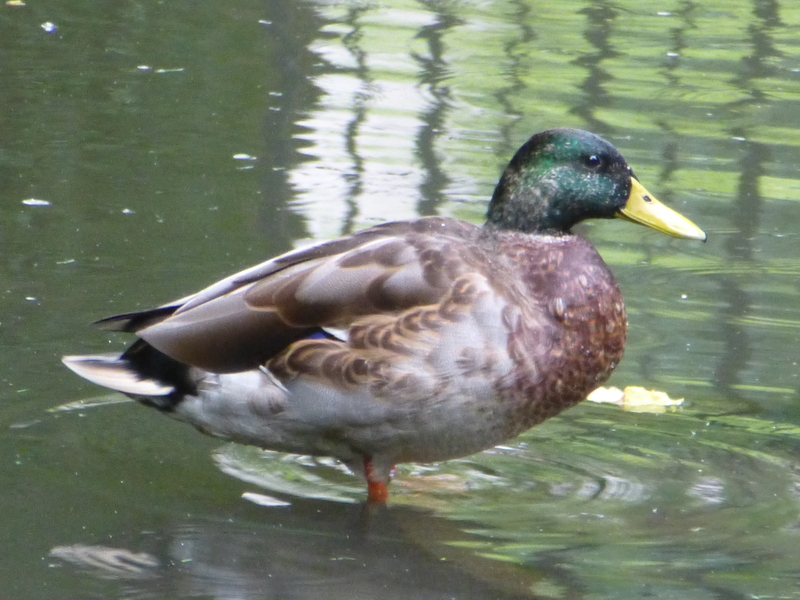 The drake (to be named; see below) is polite, not interfering with Honey’s food and only occasionally dabbling for a grain of corn or sampling a mealworm. Look at all the turtles hanging around and hoping for worms! Earlier in the day, the pair were on separate islands, with the drake looking as if he were trying to impress Honey. She didn’t look impressed. 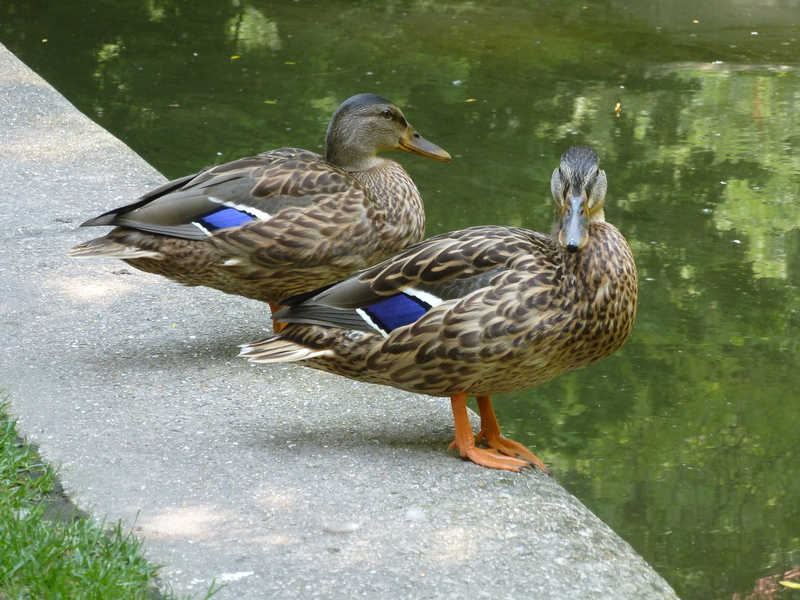 In the afternoon, however, they were lying side by side on the north duck island. Romance is in the air! Now I don’t know whether they are pair bonding, or will migrate together, or perhaps even come back together and breed. But, as a large, healthy male who is a perfect gentleman, and always asking for affirmative consent, I deem him a good mate. Now what shall we call him? Here are some choices, and you can vote for them or suggest alternative names below. (Be aware that they both could be gone any day). Honey will soon be gone: her flight feathers are large and I suspect she can fly. Although she’s well fed, the days are getting shorter, and I simultaneously dread and anticipate the day she leaves. 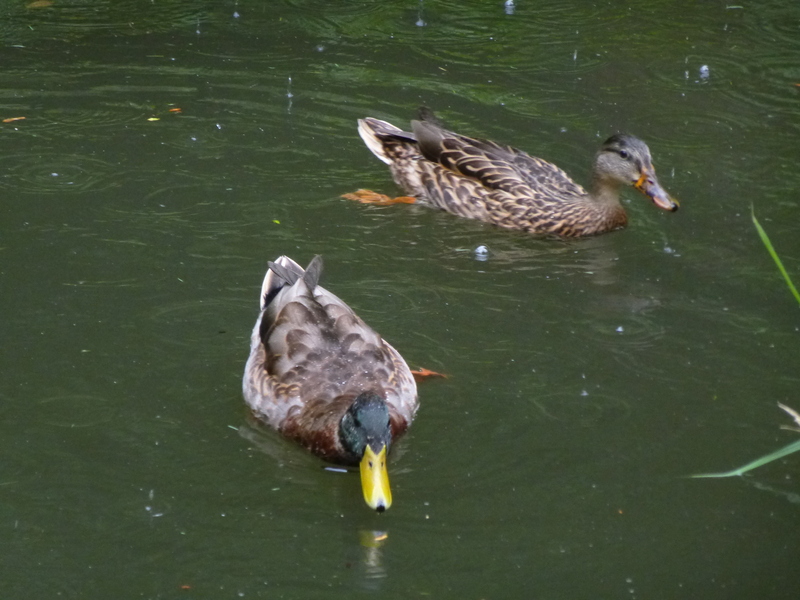 It will be sad for Anna and me, but we have the satisfaction of knowing that all eight surviving ducklings took off in good condition, and that Honey has now fledged an even dozen in the last two years. I do hope she returns next year! Stay tuned for April, 2019. Time to go to the pond, not knowing what I’ll find. This entry was written by whyevolutionistrue and posted on August 21, 2018 at 7:35 am and filed under birds, ducks, video. Bookmark the permalink. Follow any comments here with the RSS feed for this post. Both comments and trackbacks are currently closed. I suggest the name “Griz” for this fellow. Speaking of crayfish. I read yesterday that a lot of these crayfish are invasive and lead to increases in mosquito populations. 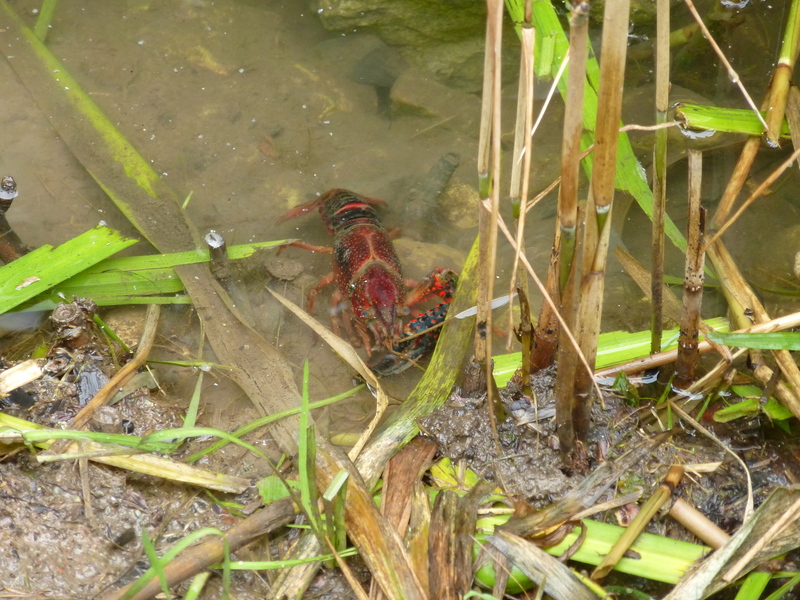 It seems that the crayfish eat predators of mosquito larvae. May be good for the pot then. We already had a drake with that exact name. He was, I suspect, the father of Honey’s brood. Good title for the movie adaptation of the comings and goings at Botany Pond. Optimus Maximus or OM for short. his environs in to one of c a l m, not ? Another mate for Honey already? Do you folks have Barry White music piped out over the pond? I’ma go with “Otis” on the hope it’s in honor of the Mad Man from Macon, the Big O, Mr. Redding his own self. Damn, boss, but for a scientist you’re quite the Romantic. Before all’s said and done, wouldn’t be surprised to catch you scratching out sonnets and odes with quill on parchment. How about Gentleman Jim (Jim for short). If we’re considering that, then how about Gentleman Jack instead? We can toast him on his return! b) Bob Parr (Mr. Incredible). Who is big. Ferdinand, from the character from Babe. 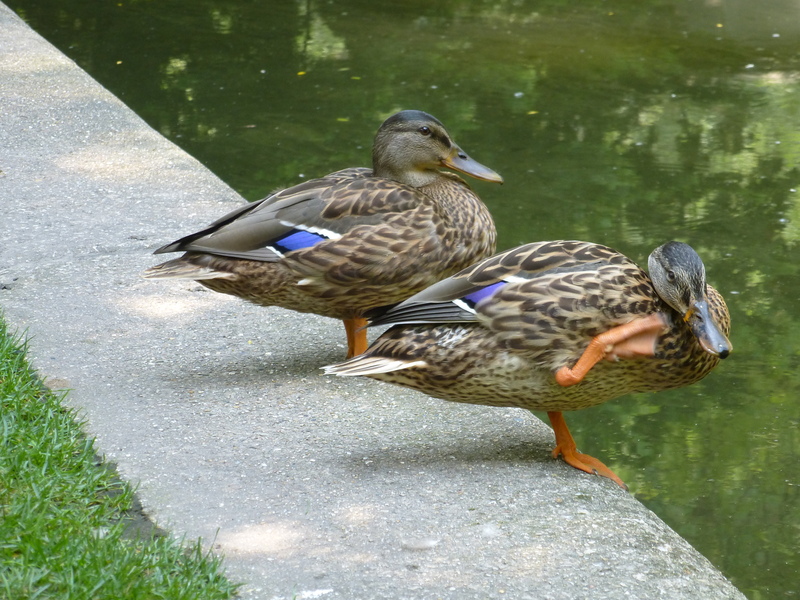 Do ducks do the “protector vs. father” thing – I’ve heard of “threesomes” being a thing in some birds. 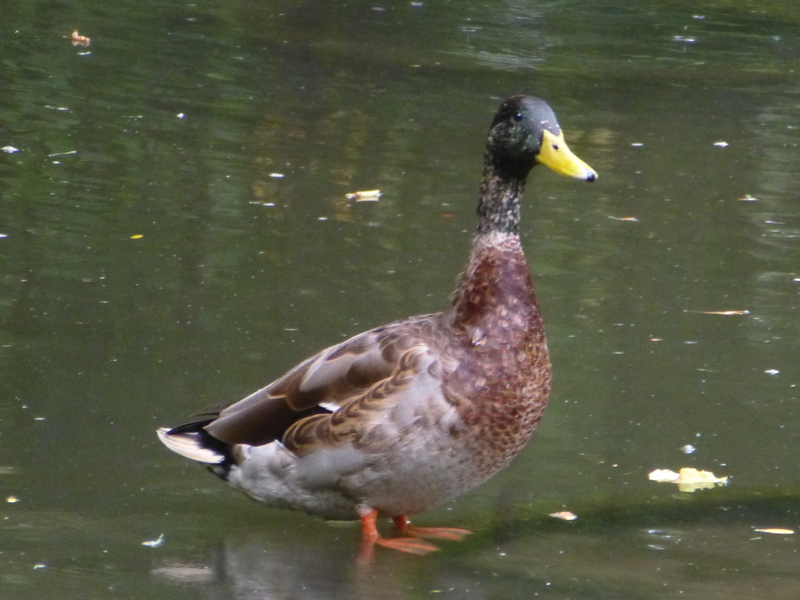 I suggest ‘Big Mal’ for the mallard drake. 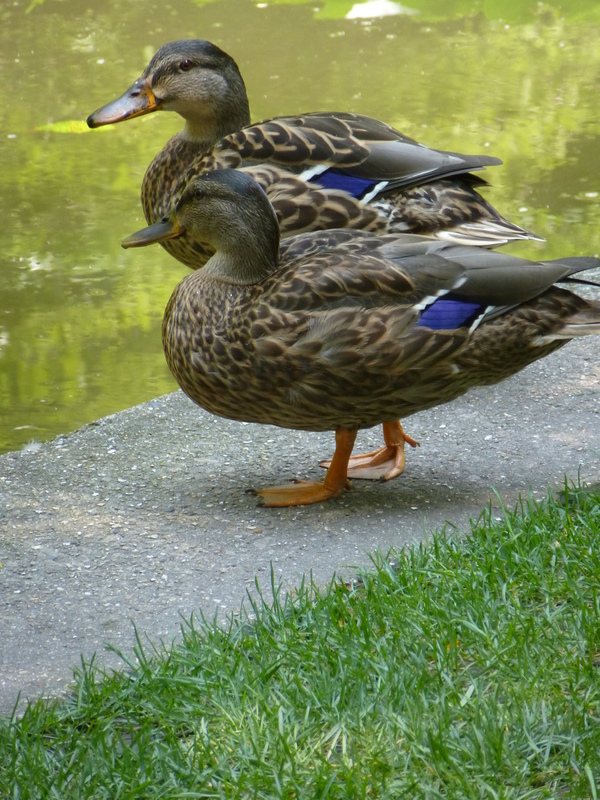 Absolutely gorgeous photos of gorgeous ducks! Big Bad John, after the song of the same name.